I consider this a pretty successful first month! I managed to read quite a few books and review most of them here! Huzzah! Work has been hectic as always in the start of a new year, but I’ve managed to schedule some downtime in May to reward myself for working almost every day these last two months. Working on this blog has been a welcome reprieve from my professional duties, and I’m proud that I’ve managed to keep this organized and up-to-date! The Dante Club by Matthew Pearl – I didn’t even make it 30 pages in before I had to put this down. My goal for 2016 was to read books I’ve had on my “to-read” list since I joined Goodreads, and I started off with a dud. The writing was so terrible I felt like I could barely understand what was happening. The Daughters of Witching Hill by Mary Sharratt – I did not finish around 130 pages. I had a hard time getting into the story. The writing was really difficult to get through, and did form any interest in the main character or last long enough to experience the granddaughter’s POV chapter. Take out more from the library and try not to purchase everything! Sounds like you had a pretty good two months!! I really need to finish the rest of the Lunar Chronicles! I also really want to read ADSOM! Definitely finish the Lunar Chronicles – I really enjoyed the last two books, and the Stars Above novella was also enjoyable! 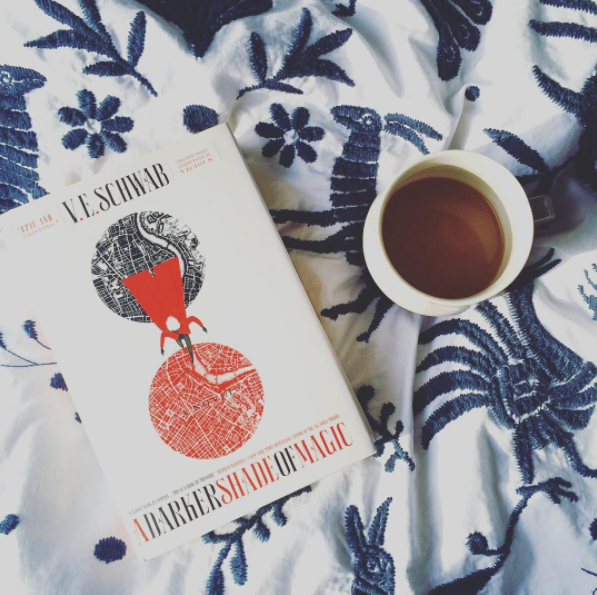 A Darker Shade of Magic was probably my favorite book of February – a huge fan of high fantasy series, but definitely suffers a bit from “first book” syndrome. It took a while to really get into the heart of the story because she spends about half of it world building. But I feel like the second book will do much better in terms of pacing and plot.